Brunch and Mother’s Day go together like bacon and eggs, like a shot and a beer, like moms and flowers (Note: get mom flowers). 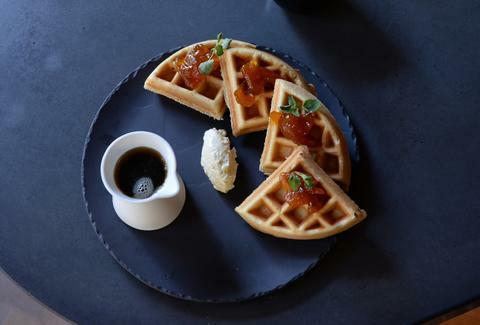 But it’s late in the week and you still don’t have a reservation... until you call one of these amazing brunch locales that miraculously still have tables available -- and maybe even special treats for mom. As if a bowl of beignets, caramelized potato hash, and baked egg casserole weren’t enough, this upscale hotel restaurant is helping you out with your Mother’s Day presents this year with a free mimosa for mom and sweet treat to take home. We already waxed poetical about Bluestem’s phenomenal brunch burger, but that’s not the only reason to score a reservation this Sunday. This SOMA hot spot will be giving all moms a house-made sweet from Pastry Chef, Curtis McDonald. Not only is a $40 pre-fixe menu more than reasonable, but this James Beard semi-finalist serving upscale British pub fare is bloody delicious. And amazingly, it still has (limited) reservations available. The only thing better than deviled eggs (with caviar!) and Bellinis over a leisurely brunch, is deviled eggs and Bellinis over a leisurely brunch in a gorgeous national park. Which is exactly what you’ll get if you score one of the few tables left at this Mother’s Day hot spot. Pro tip: Those with reservations have until Wednesday to cancel, so call late Wednesday or early Thursday to snag one of the cancellations. And ask for a coveted table on the outdoor deck. Not only has AQ recently overhauled its menu and décor to reflect the spring season, but $50 gets mom an entrée, shared family-style sides and pastries, orange juice, and coffee. And at the time of writing, there were still several tickets available throughout the day. If you got your penchant for drink deals from your mama, then she’ll be just as excited as you to know HECHO is gifting moms two-for-one margaritas with its upscale Mexican brunch. The bright, lively space, and delicious cocktails (the avocado margarita and pinche picante margarita are especially delicioso) make for a super cool setting to celebrate your super-cool mom. Moms loooove ambiance and this charming bistro has just the je ne sais quoi she’s looking for. Enjoy delicious French brunch fare while listening to live jazz by renowned musician Mark Robinson on the tres charming cobblestone patio to score major mom points. Not only has Executive Chef Rocky Maselli put together a festive Italian brunch, including traditional dishes like sweet strawberry pastafrola and savory scialatielli allo scoglio, but mom gets a goodie bag of treats to take home. Expect specialty libations and dessert to add to the celebrations. It’s amazing that one of the hottest brunch spots -- complete with an industrial-chic heated patio and ever-evolving menu of inventive California cuisine -- still has a couple spots open. But it does! For now. Call ASAP. The brunch menu boasts three courses, including many vegetarian and gluten-free options, for $65 per person ($25 for kids). Sixty dollars doesn’t just get you brunch; it also gets you a ticket to one of the best drag shows -- and a quintessential San Francisco experience -- 21 floors up. Doors open at 11am and show starts at noon. If your mom likes ceviche, she’ll love this lively SF staple with not one, but seven different takes on the classic Peruvian dish. If raw fish isn’t your thing first thing in the morning, huevos rancheros, latin-inspired omelets, and Canela French toast with dulce de leche marscarpone will likely satisfy your traditional brunch cravings. Amy Copperman is a writer in San Francisco. She can’t wait to treat her mom to eggs this Sunday.